Fall spells cross country meets and BIG marathons . . .
2027 of the best Iowa runners, race directors, coaches, volunteers & fans receive this e-mail over 30 times per year. Runablaze.com has great pictures of the Runablaze Iowa athletes, old blazing news & All-Time Iowa Records. Frank close to 5K record? Learn more about the team, visit the web site Runablaze.com that includes the resume of the team athletes and past running highlights. 1300 of the best Iowa runners, race directors, coaches, volunteers & fans receive this e-mail. Red Flannel, Loop the Lake, Friendly Sons of St Patrick, Market to Market, Dam to Dam, Marathon to Marathon, Clive Running Festival, Sturgis Falls, Fifth Season, Midnight Madness, Park to Park, Capital Pursuit, IMT Des Moines Marathon and Living History Farms. And now for the "News" . . .
Mason Frank won the DM Marathon 5k (Oct. 20) in 16:17 and Chris Robertson was a close 2nd in 16:25. The course turned out to be long, potentially a quarter of a mile. Chris states, "We split through 5k in 15:06 (Mason) and 15:14 (Chris)". The race record was set by Runablaze Iowa teammate Brett Carter in 2011, 15:06. Ellen Ries was 7th in the Half-Marathon 1:23:10, followed by Susie Duke in 9th at 1:23:45 and Jen Van Otterloo in 11th at 1:25:42. Susie reacted to her time, "Since much of my training was done pushing a jog stroller, it was an unexpected PR for me." Susie is training to do the Memphis Marathon in early December. Daniel Sevcik was 17th in the Marathon running a 2:41:53, running the first half in 1:17:18. Runablaze Iowa athletes are based throughout Iowa. 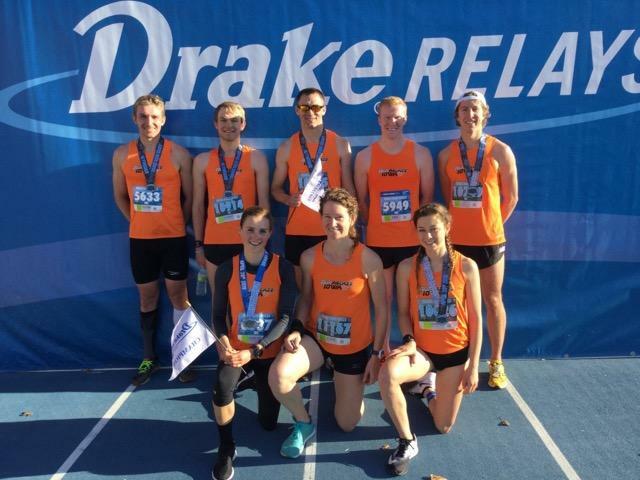 Formed in 2006, the purpose of the team is to improve post-collegiate Iowa distance running. Major Iowa running specialty stores, Iowa races and Iowa runners at those races support Runablaze Iowa. Team Runablaze Iowa - Summer Heat? Summer Heat usually slows down distance running - not this year, great weather for training or racing! Red Flannel, Loop the Lake, Market to Market, Hy Vee road races, Dam to Dam, Marathon to Marathon, Clive Running Festival, Sturgis Falls, Fifth Season, Midnight Madness, Park to Park, Capital Pursuit, IMT Des Moines Marathon and Living History Farms. Adam Condit ultra running in 2013. Adam ran Grand Canyon Rim to Rim double crossing in April, solo. He was ready for a competitive 50 mile trail race debut at Devil's Lake (July 13, WI). Adam recounts, "A fun but somewhat bittersweet ultra marathon ... finally hunting down first place by mile 35. I led from there to mile 48 where I was passed (quickly) going uphill. I finished 2nd overall in 7hr 23min in one of the Midwest's most rugged ultras around Devil's Lake. I felt dialed in with nutrition and energy, but the relentless up and down trashed my legs before really having to slow down the last 5-6 miles." Adam plans another 50 miler near Madison this fall, a more rolling and smooth course. Danna Herrick ran Have a Hearth 5K (West Des Moines, July 27) in winning in 18:21. Nate Hopp won the Swisher 5K (Aug. 3) in 16:22, Phil Young was 2nd in 17:06. Robyn Friedman continues here comeback at the M.A.M.M. 10K (Monroe, Aug. 10) winning in 38:20. Husband and wife team finished 2nd male and female at the Kraut Route 5K (Lisbon, Aug. 10) - Dan Schofer ran 17:14 and Marie Schofer 18:37. Iowan Diane Nukuri-Johnson continues to race with the best, this time in the Northeast. At the Beach to Beacon 10K (ME, Aug. 4) she set a personal record running 32:36. A week later at 41st Falmouth 7 mile (MA, Aug. 11) she was 4th in 37:16. Kudos to any runner that gives up their running to put on a race. Double kudos for any race director that times and scores a modest sized race. Runners Colleen Webb and Paul Grinvalds (West Des Moines, July 27) each did an admiral job creating results at their 200-250 finisher races. The key was reasonable expectations and awards. Thanks Colleen and Paul, demonstrating "how it's done simply, cost free". Jason Flogel set a PR by over a minute in the USA Grandma's Half-Marathon Championships (Duluth, June 22) in 1:06:34. Jason comments, "I broke every PR of mine from mile 7 onward. It was easily one of the deepest fields I've ran in as I placed 59th overall." Ellen Ries finish 45th in the women's field running a 1:20:15. There were 39 US men under 1:05 and 34 US women under 1:18. Dam to Dam top women finishers did well, Kelly Brinkman (Dam 2nd) was 3rd in the Half and Pasca Cheuiyot (Dam 3rd), training in Ft Dodge ran a 2:34:25 in the marathon. Nate Hopp won the Hog Wild Days 5K (Hiawatha, June 22) in 16:01. Robyn Friedman, now a master's runner, won the Rhino Rampage 5K (Des Moines, June 15) winning the entire race in 18:35. Randy Bill, Chris Robertson and Mason Frank were part of a 12 man Ragnar Relay team that competed at the Madison to Chicago 200 mile relay (June 8-9). The team won the event in 19:44:22, a sub-6 minute pace. Mason reports, "Randy led the team with an average pace around 5:16 per mile for (his 3 legs) 20 miles. I was our second fastest runner with a 5:26 pace for 20 miles and Chris was in the mid 5:30s." Mason continues, "We were battling another team for most of the night but ended up pulling away and winning by 14 minutes. It was a brutal race with everyone running three separate times, each time about 5-6 hours apart. Staying up all night and running at that caliber three times was very taxing on the body." Marie Schofer is back on the roads. In her hometown she ran the Mt Vernon Chocolate Stroll (June 1) in 21:07. At the Lisbon Jugglefest 5K (June 9) ran 19:51. Marie states just two months post-pregnancy, "I've been in a normal running routine for the last few weeks and look forward to getting back to workouts and more races in the next few months." Chan Y Woo finished 4h at the Bayshore Marathon (Traverse City, MI - May 25) in 2:32:47. Chan reports, "I was on crutches a few months ago. After my second knee surgery in October, I feel like I was almost completely losing my strength to run fast. In order to protect my knee, I didn't start marathon specific training until the last week of March. I slowly increase the intensity of the workout as my knee condition is getting better each day. My weekly training mileage hasn't exceeded 65 miles." Pete Riegel, a leader of course measurement in the US looks back . . . I miss the old days too, back when I was running in the early 1970's to 1990's. I didn't know it at the time, but it was a Golden Age for those who wanted to race. Accurate courses were few, but the fields were small. The smallness of the fields allowed the racer to focus on who was ahead. The typical marathon in Ohio had 100 to 300 people and was usually out on country roads. In those days we mid-packers recognized all the familiar faces and knew who we would be racing against in our age group. As time went by, certification became more common, and as timing became more mechanized the fields began to grow. My later experiences in racing were in races with bigger fields, and there was more difficulty trying to focus on any individual competitor. I remember the Athens (OH) marathon in the late 70's. I was coming around a corner at mile 17 or so, and I spotted a runner way ahead of me. I had not seen him before, so I figured he was slowing. It was a great motivator to try to catch him. I finally did pass him, but it took me four more miles to do it. This sort of motivation is absent when a vast herd of 10000 runners is the field. Lots more people are running in races today, but I sense that racing is not the principal motivation for many of the runners. Jason Flogel won the 22nd Heritage Trail Run 10K (Dubuque, May 11) in 32:06. Kristy Harken won the RUNorwalk 8K (Norwalk, May 11) in 30:52. Updates (really corrections) - Fitness Sports has 800 races listed on their website not 400 as reported, geez that's a lot! Ellen Ries was 4th in the HyVee 6K not 5th as reported. Ellen is a dietitian, employed at the West Des Moines HyVee. Robyn won her 10th wooden shoe (almost consecutive) not 11th as reported. She was injured last year and watched as Casey Owens won the coveted shoe (a wearable trophy, not great for running). Hy-Vee Road Races offers $120,000 prize money and Luke looks to the future. Phil Young was 2nd at the River Run 5K (Iowa City, Apr. 28) in 16:15. Mason Frank was 9th at the Hy-Vee 6K in 19:27 (Des Moines, Apr. 28) in 19:27 (5:13 pace). Ellen Ries was 21:56 (5:53) and Casey Owens 24:07 (6:29). The 6K distance is rarely run (ever?) except for college women XC - so pace is included. Randy Bill ran the Half-Marathon in 1:10:22. Mason relates on his week at Drake. I ran in the Grand Blue Mile - - I haven't done a speed workout for over three months now and have been pretty beat up from the Boston Marathon still. I went out in a 2:11 and felt good but I guess the second half didn't go as well as I thought it did. I ran in the Hyvee Road Races 6K - - I felt good through 3K then had a rough 4K and 5K but my 6th K was solid and finishing on the track was fun! Fact checkers abound, the Blue Mile was warmer than the reported, "unseasonable 35 degree, cloudy and windy weather", apparently it was closer to a balmy 40. The Relays weekend easily had the best weather of 2013, beautiful. Hy-Vee Road Races gave out the largest checks in Iowa running history. 6K prize purse was $10,000 ($2,000 first), 10K had $30,000 ($5,000 first) and Half-Marathon had $70,000 open ($12,000 first) and $10,000 master ($2,000 first). Wow, that's a lot of dough! Luke Demmel juggles, plans and takes to the hills . . .
As far as my future goals - I am finishing up my last semester at ISU (Iowa State University). I will graduate with a Major in Construction Engineering and a Minor in Spanish. I am currently deciding where I want to go after college. I've found it very difficult to make such a huge decision at this point in my life. 2013 will definitely be a new experience for me. I plan to running the Green Bay Half-Marathon on May 19th. I want to improve my half marathon time at Green Bay. I'm currently taking some time off after my last marathon, but I'm anxious to start back up again. As far as the future goes, I want to improve my road racing times and reach some goals I have set for myself. Trail and Mountain running have had a huge impact on me and I want to pursue the goals I have for myself regarding off-road racing. Trail and Road racing are completely different beasts, so the decision I make after graduation will definitely have an impact on what I decide to chase. Beyond the summer, I plan to find a marathon in the fall and have another go at breaking into the 2:20's for the marathon. I have a lot of ideas and plans for my running future. But I know I have a ways to go before I can begin to talk about them. Other top Runablaze Iowa athletes will be featured in this series in upcoming e-mails. Nathan Hopp was 2nd at the 1st Marion Rotary Marathon (Apr. 21) in 2:36:49. Allie Jagielo was 2nd in the Half-Marathon in 1:31:51. Allie explains, "Since I haven't raced since last June I was happy to establish a starting point as I get back to racing." The course for the full and half was hilly and it was a windy day. Kristy Harken easily won the competitive division of the Grand Blue Mile (Des Moines, Apr. 23) in 5:18. She lead from start to finish. Casey Owens ran 5:37 and master runner Christine Price 5:54. In the men's competitive division Mason Frank was 4th in 4:35, Martin Popp ran 4:42 and Joe Aulwes 4:49. The 4th running of the race endured unseasonable 35 degree, cloudy and windy weather. David Sevcik won the NICRA Half-Marathon national championship (Apr. 6). David Robertson was credited, who is the father of team mate Chris Robertson. Boston Marathon is in the news! Few remember 30 years ago when Greg Meyer led a 1-2-3-4 sweep for the Americans at the Boston Marathon with his 2:09:01. Meyer was the last USA man to win there. Ron Tabb, Benji Durden, and Ed Mendoza completed the USA top four with 2:09:32, 2:09:58, and 2:10:07 respectively. Joan (Samuelson) Benoit ran away from the women's field with her 2:22:43. At the London Marathon, after a moment of silence to honor Boston, the men flew through the 10K mark in 28:56, a 2:02 flat pace. They slowed as 3 ran in the 2:06s. Ellen Ries steps up her miles for longer races. Currently I am training for the 1/2 marathon distance, preparing with longer workouts and shorter 5k and 10k races. I give a lot of the credit to my coach, Antonio Vega, of Zoom Performance. Without his guidance I would likely still be bouncing around, not able to make a decision about the future of my running career. The transition to post collegiate running was often challenging, as the idea of significantly increasing my mileage was terrifying, given the fact high mileage usually ended up in injury in previous seasons. I have learned it is best for me to take one workout at a time. If I start looking too far into my training schedule I psych myself out. I take that "one at a time" mentality into each workout, as well. If I focus on hitting the time of each interval or each mile of a tempo, it usually ends up being a more successful workout than if I think about the daunting thought of the workout as a whole. As a dietitian, I would be remiss to leave out the importance of sports nutrition in my training. I am in NO WAY perfect when it comes to making optimal nutritional choices, but I have learned that nutrient quality and timing play an important role in staying healthy and being able to perform my best.